Sequestration in particular would result in draconian cuts to federal programs that support the health, wellness, and livelihood of gay and transgender Americans and their families. From workplace nondiscrimination protections to health care coverage to supporting our nation’s elders, cuts in these programs would seriously harm gay and transgender Americans. The fiscal showdown is looming, with a little longer than one month remaining before it possibly goes into effect. While policymakers work to hammer out an eleventh-hour deal to avoid devastating budget cuts, it is important to remember that we did not get to the edge of this metaphorical fiscal cliff by accident. In 2011 Congress passed the Budget Control Act of 2011 as part of a deal to raise the ceiling on our nation’s debt. As part of that deal, congressional Republicans held the nation’s credit worthiness and economic recovery hostage to force painful and immediate spending cuts on the country, totaling more than $1 trillion over the 10-year period from 2012 through 2021. In addition to these immediate cuts, the Budget Control Act also left Congress with the task of finding an additional $1.2 trillion to cut from the budget over the same 10-year period. In the fall of 2011 the congressional super committee, tasked with designing a plan to reduce the deficit by this amount, failed to produce an agreed-upon proposal. Unless Congress acts during the upcoming lame-duck session, automatic cuts to the federal budget—known as sequestration—will be triggered and will go into effect beginning in January 2013 so as to achieve the $1.2 trillion in deficit reduction as mandated by the Budget Control Act. Additionally, a number of tax cuts are set to expire at the same time that sequestration is set to go into effect at the beginning of 2013, potentially creating a perfect storm that would simultaneously mandate across-the-board cuts to the federal budget and raise taxes on nearly all Americans. Economists agree: Failure to reach a resolution would hurt job growth, weaken our economic recovery, and impact all Americans. Sequestration would hurt gay and transgender workers and threaten their employment security because federal agencies would have fewer resources to investigate claims of employment discrimination. Sequestration would compromise gay and transgender health by reducing programmatic funding used to address the health care needs of gay and transgender Americans. Sequestration would remove critical resources from government agencies currently working to combat bullying and school violence against gay and transgender youth. Sequestration would limit the federal government’s ability to address the high rates of homelessness among gay and transgender youth. Sequestration would limit the government’s capacity to prevent discrimination in housing against gay and transgender renters, tenants, and potential homeowners. Sequestration would hamper the government’s efforts to prevent violent crime against gay and transgender people through enforcement of hate crimes legislation and other similar federal initiatives aimed at preventing violence in this community. The bottom line: Gay and transgender Americans simply cannot afford to be caught in the middle of the fiscal showdown. Reductions to federal programs under sequestration would be particularly harmful to gay and transgender people of color, a population that already experiences significant health disparities and economic vulnerabilities due to their double minority status. While there has been significant research and speculation on the possible effects of sequestration on federal programming, it remains to be seen exactly how the full impact and extent of the potential budget cuts will play out. Still, it is clear that sequestration in any form would have a devastating impact for gay and transgender people, as well as their families. Congress can and must work to reach a deal before this year’s end to ensure that this does not happen. Fortunately, congressional lawmakers from both sides of the aisle are doing just that. As negotiations proceed, lawmakers must lay the foundation for a rational, long-term solution to the fiscal challenges facing our country. Legislators can achieve this by considering a balanced approach of spending reductions and revenue increases similar to what has been proposed by a number of bipartisan commissions and what is reflected in the White House’s budget proposals. 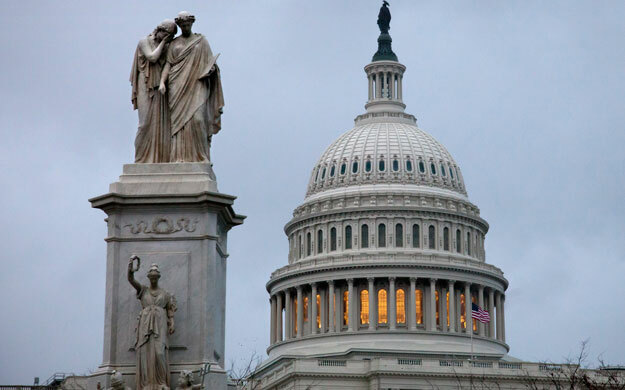 If lawmakers cannot agree to a comprehensive deficit deal by year’s end, Congress should at the very least pass a short-term delay so that sequestration does not go into effect at the beginning of 2013. A delay would then provide the newly elected class of congressional leaders with the opportunity to immediately craft a viable, bipartisan, and long-term solution, and prevent devastating cuts to federal programs. Congress must act swiftly to put our country back on a stable fiscal path that strengthens the current economic recovery. But Congress must do so while avoiding across-the-board spending cuts that would be harmful to millions of Americans, including those who are gay and transgender. The clock is ticking. Andrew Cray and Crosby Burns are Research Associates for the LGBT Research and Communications Project at the Center for American Progress. Erin Fitzgerald is an Urvashi Vaid Research Fellow at the National Gay and Lesbian Task Force.